Amsterdam, the Netherlands – Royal Philips (NYSE: PHG, AEX: PHIA) and the Netherlands Cancer Institute today announced a new agreement that expands their long-term collaboration and enforces the mission of the Netherlands Cancer Institute in offering the best possible care to cancer patients. The agreement will give the only Comprehensive Cancer Centre in the Netherlands access to the latest healthcare innovations to contribute to the institute’s spearheads: personalized medicine and image guided precision treatment. The Netherlands Cancer Institute and Philips will be working closely together to realize a paradigm shift in the surgical treatment of cancer patients to improve their treatment outcomes. They aim to advance from ‘standard’ surgical procedures towards personalized precision surgery to enable improved first-time-right removal of all tumor tissue. 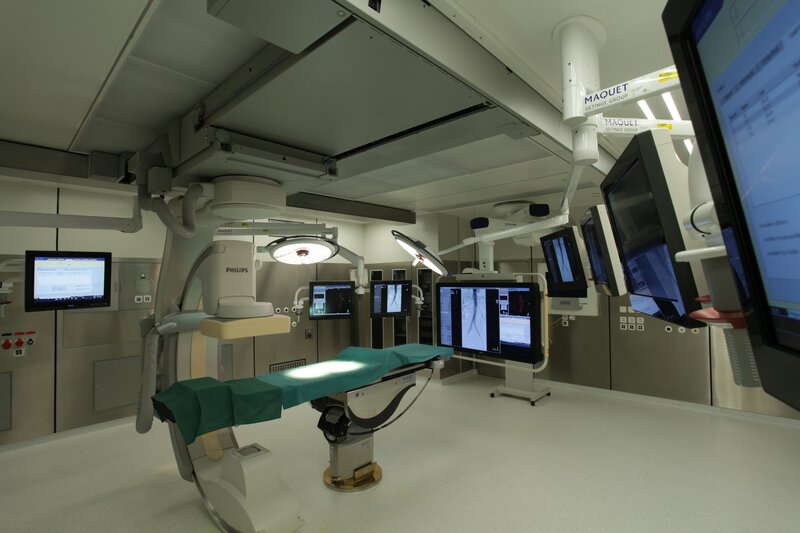 To this end, the agreement includes an innovative hybrid suite, a combination of a sterile conventional operating room with a lab for image guided therapies. It offers an integrated and comprehensive solution in which a wide range of procedures can be performed from conventional surgery to new live 3D image guided therapies. The Netherlands Cancer Institute also joins a group of early adopters with the commercial installation of the new Philips Vereos – the world’s first and only digital PET/CT system - that through its digital detector technology offers high image resolution at low radiation dose. It will support the Netherlands Cancer Institute enhancing cancer diagnosis and staging and advancing personalized medicine in oncology. The new agreement expands the existing research collaboration between the organizations, which has been in place since 2011. Besides the development of image-guided surgery, the partners are also working together to optimize radiotherapy planning. The Netherlands Cancer Institute is also a member of a research consortium led by Elekta and supported by Philips as the MRI technology partner. The consortium is developing the world’s first high-field MR-guided radiation therapy system to allow doctors to adapt radiation therapy during the procedure. This could improve treatment accuracy, potentially reducing side effects and enabling increases in the therapeutic dose. “As a Comprehensive Cancer Centre combining state-of-the-art research and hospital facilities, we are committed to contributing to innovations that change clinical practice in patient care and to continuously improving our efficiency and patient centeredness. The new equipment will be used for diagnosing and staging cancer in the initial stages as well as for cutting-edge image-guided treatment and therapy monitoring. The new imaging capabilities will be a cornerstone of our research into personalized and image-guided therapy, allowing treatment plans to be tailored to the patient at the earliest stage for improved patient outcomes,” said Wim van Harten, board member and Director Organization and Management at the Netherlands Cancer Institute. The agreement further includes Philips’ digital Ingenia 3T MRI system, digitalization of their existing 3T MRI system through Philips’ dStream upgrade program and EPIQ and CX50 ultrasound. Healthcare informatics will give the hospital an integrated oncology solution that combines patient data across relevant imaging modalities to support disease diagnosis, treatment decision and tracking over time. The Netherlands Cancer Institute is located in Amsterdam. Its research institute accommodates approximately 750 scientists and scientific support personnel. Its hospital, Antoni van Leeuwenhoek, employs over 150 medical specialists and is continuously renovating its facilities. In 2015 it will include 220 beds, 10 operating rooms, 11 radiotherapy units and an outpatient clinic that sees over 8000 new cancer patients per year. It is the only OECI designated Comprehensive Cancer Centre in the Netherlands, and is an important national and international center of scientific and clinical expertise, development and training. The Netherlands Cancer Institute (NKI) celebrated its 100th anniversary in 2013. For decades it has been among the absolute world top when it comes to the unique connection between the care and research that makes all the difference for cancer patients. In multidisciplinary teams surgeons, oncologists, radiologists, radiotherapists and nurses are continuously working on tailor-made treatments. Because in essence no two cancers are the same. As it is now becoming possible to unravel the specific genetic changes in the nucleus of the cancer cell that influence the behavior of the tumor, our researchers are increasingly capable of developing new, tailor-made treatments. The Netherlands Cancer Institute chose, already a century ago, for the ground-breaking approach of combining the research at the Netherlands Cancer Institute with the specialized cancer care of the Antoni van Leeuwenhoek hospital. The institute is located in Amsterdam. It is the only OEIC designated Comprehensive Cancer Centre in the Netherlands, and is an important national and international center of scientific and clinical expertise, development and training. News from the Netherlands Cancer Institute is located at www.nki.nl and www.av.nl.